The lamp is made of enamelled steel sheet, outside black and inside white. The distribution box is made from Bakelite and is installed on the lamp dome. 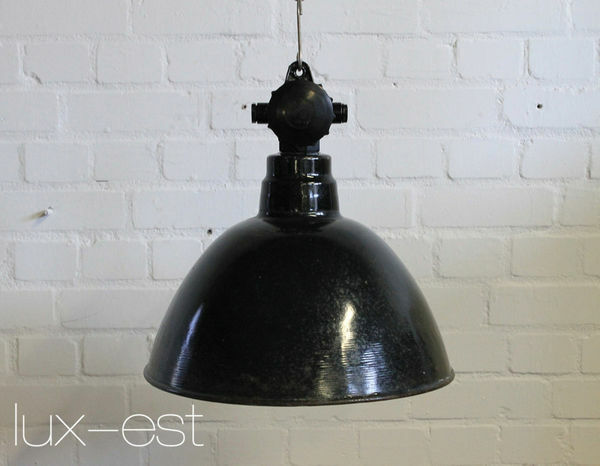 There were produced three different sizes of this kind of industrial factory lamp, this is the medium size M.
Technological know-how, applied materials and design for such high-quality industrial lamps were created around 1920/30. While production in Western Europe changed to plastic from the fifties, fabrication remained unchanged until the collapse of the former GDR.